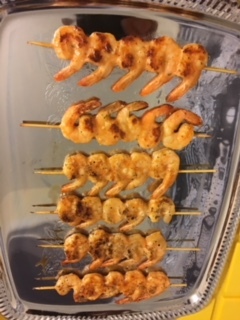 These are very tasty Shrimp skewers- perfect for any bbq setting. I’m adding these to my inventory today 4/11/18 and I just had them for lunch- loved them. Their not over powering with the Lemon or Garlic. The flavor profile is balanced and left me thinking- TASTY! Crazy easy to work with- just place on grill frozen- 3/4 minutes on each side and your golden. I can’t imagine anyone not liking them- great entertainment tool. The skewers can be picked up with fingers so their an excellent hors d’oeuvre item as well. You can even thaw- pull off the skewers- remove the tail shell and quickly stir fry. Each box has 2 bags of 12 skewers each. So 24 skewers in a box.